Food Storage Has Never Been Easier And More Colorful! 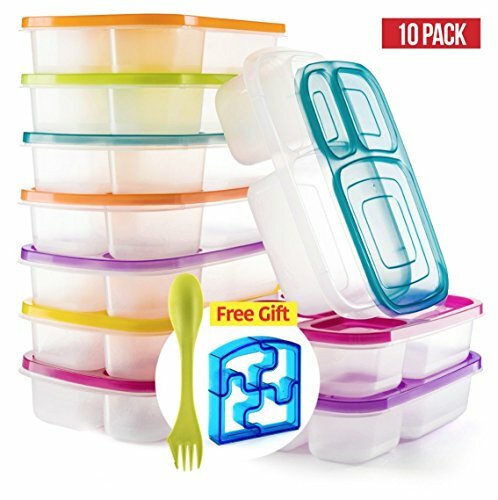 Perfect Fit presents you with this premium set of 6 clear food storage containers with a stackable designed and secure multicolored lids. ...food storage for leftover food. ...meal prep containers (ideal for busy parents). ...portion control containers to have better control of your diet. ...baby food containers for easy feeding on the go. ...lunch boxes and snack boxes (suitable for school, college, work, traveling, hiking, camping, picnics and beach getaways). The leakproof lids allow you to carry the bento lunchboxesaround without any worries, whether you fill them with solid or liquid food. These Snack Containers Are Built To Last A Lifetime! This in an investment you won't regret, because if you buy these kids' lunch boxes today, you won't haveto replace them anytime soon! In fact, our lunchboxes have an incredibly robust design and they are made with durable materials that are microwaveable, refrigerator and dishwasher safe. Need we say more? Only The Safest Materials For You And Your Loved Ones! Our food prep containers and the airtight lids are made with food grade, BPA-free and phthalate-free materials. This means that you can use them daily without any fears -besides, we wouldn't see you anything we wouldn't use ourselves! Order the colorful bento lunch box set and if you're unhappy with its premium quality and practicality, we'll refund you. Premium quality food safe - our Bento lunch boxes are made of high quality materials and are 100% last intervention of BPA, phthalates and PVC to ensure that you and your family eats only the best quality of food which do not lead to any toxics or plastic unwanted odors. These lunch boxes are ideal for adults and children, whether boys or girls. boxes are also safe for use in microwave, refrigerators and dishwashers. Bonus - with each set of 10 lunch Bento boxes you also get amazing accessories 2 which is insurance to make your daily life much more convenient - a unique sandwich cutter Puzzle, and a color game 2 in 1 fork how spoon. quickly prepare their sandwiches with the help of Creative Puzzle Sandwich cutter and use fork how spoon fruit, salads, rice, noodles, pasta, or anything else - compact and essential. Multicolor - stackable boxes, boxes come in a set of 6 pieces with multicolored caps - this helps you to identify each of the box only and also makes the boxes look smarter and Cooler. the boxes can be easily nested together or stacked together, which may occupy a minimum of storage space in your kitchen. Effective part of control and ease of use - Japanese-style Bento lunch boxes are a great way to be part of control in practice or in routine - as per Japanese thumb rule, 3 pieces of grain, 2-piece vegetables and 1 part protein makes for a great almu I erzo and box helps you get to your office or schools daily to help maintain a healthy lifestyle. cover perfectly still can be removed in a way completely without problems - Kids friendly design. 100% satisfaction guarantee last intervention of risk - we offer you 100% satisfaction guarantee last intervention risks so buy with confidence; no questions asked. However, we are pretty sure that you would love these premium Bento boxes or Japanese lunch boxes and these will make it much easier to adapt to a healthy lifestyle. If you have any questions about this product by Perfect Fit, contact us by completing and submitting the form below. If you are looking for a specif part number, please include it with your message.